Who can use these Brexit clauses? Anyone whose business will be affected by Brexit – whether the business is based in the UK, the rest of Europe or elsewhere. Agents & distributors, suppliers and manufacturers can all be affected. What are these Brexit clauses for? Given the uncertainty over the terms of Brexit, you need a mechanism for handling the changes when they occur. Our Brexit clauses offer this, plus some ideas for dealing with changes in laws and regulations that could affect you. And in some cases, if the impact is really tough, you may want to be able to cancel a contract. We have wording to deal with this. The situation in some ways is similar to force majeure – an unforeseen event that can cause disruption and damage. But until it happens, you won’t know how badly it will affect your business. What are the main issues for a business when considering a contract clause to deal with Brexit? Firstly, you need to consider the risks. Until we know whether or not there will be agreement over the terms of Brexit, you need to assume a hard Brexit with the UK suddenly ceasing to be a member of the EU. Second, if you have – or you are planning – business with other parties in the EU (or you’re based in the EU, trading with the UK) what are the main risks for that business? They could be practical – e.g. do you need to pre-purchase goods to avoid the risk of border delays after March 2019 – or they could affect pricing and profit– e.g. the risk of new tariffs. Third, if you have not already done so, talk to your counterparties and see whether you can reach agreement on how those risks will be handled. ContractStore’s Brexit clauses offer forms of wording that can be used and adapted to deal with some of these risks. A Brexit clause doesn’t solve the problem but it does provide a mechanism/procedure for dealing with the risks and for helping to achieve an agreed outcome. What detailed terms do these Brexit clauses cover? Certainly. Our document contains templates which you will need to adapt,both to meet your particular circumstances and for the wording to fit in with the rest of your contract terms. ContractStore’s documents are in MS Word and easy to adapt and use as often as you require in your business. Is your Business Ready for Brexit Given by solicitor Giles Dixon, it has a lot of information on Brexit clauses including some samples. ContractStore is not a law firm but a publisher of legal templates. These are all written by experienced lawyers. So, we can arrange for our customers to obtain legal support if they need special terms or a bespoke template. . For more information see our Legal Services page. If you have long term relationships with suppliers, buyers, agents or consultants and if those relationships involve EU citizens or trading with other countries in the EU, how do you plan for Brexit? One answer could be a Brexit clause in your long term contracts and arrangements. 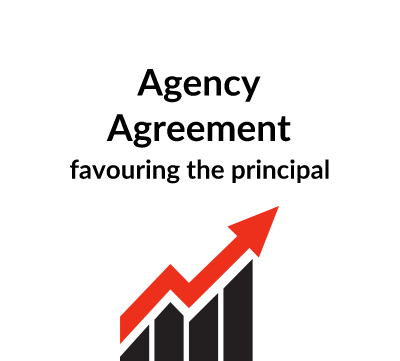 This especially applies to businesses with buyers, agents or distributors in Europe and to those who act as agents or distributors in the UK for suppliers based in the EU. 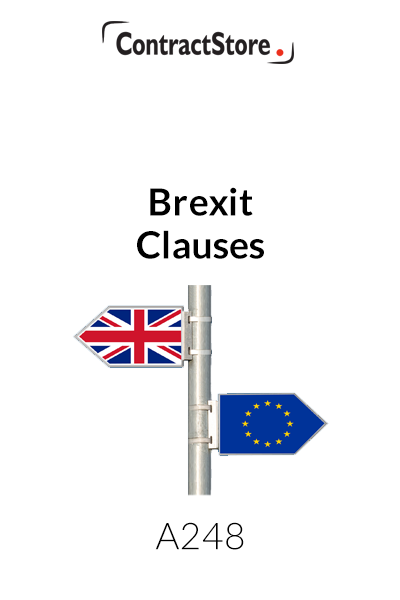 This document contains a number of sample clauses for use in contracts which might be affected by Brexit. 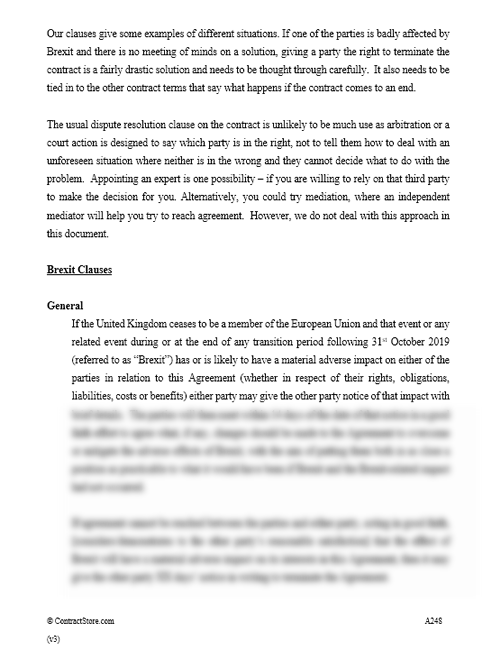 Any such clause needs not only to be worded to conform to the language of the contract to which it applies but also, so far as possible, to deal with the relevant issues that are likely to affect one or both of the parties in the event of Brexit. Bear in mind that a Brexit clause may have implications for other terms in a contract, so those implications and any consequential changes elsewhere in the contract need to be considered and dealt with when the Brexit clause is introduced. This can, in particular, be relevant when a Brexit clause is so worded that it can result in the contract being terminated: a reference to the relevant provisions of the termination clause in the agreement will be needed. • Fourth, if there is no agreement, does one of them have the right to terminate the contract or do they carry on and cope with the risk or do they get a third party to decide on a solution? Brexit and there is no meeting of minds on a solution, giving a party the right to terminate the contract is a fairly drastic solution and needs to be thought through carefully. The usual dispute resolution clause on the contract is unlikely to be much use as arbitration or a court action is designed to say which party is in the right, not to tell them how to deal with an unforeseen situation where neither is in the wrong and they cannot decide what to do with the problem. Appointing an expert is one possibility – if you are willing to rely on that third party to make the decision for you. Alternatively, you could try mediation, where an independent mediator will help you try to reach agreement. Legal advice on the use of these sample clause is advised. Our clauses are divided into 6 sections: General, General with definition of Brexit, Import Duties, Regulatory and Legal, Restrictions on movement of people, and Territory. • General We have a clause that requires the parties to meet and try to resolve any issues that arise as a result of Brexit. The second paragraph is optional and would allow a party to bring the agreement to an end if Brexit has a material adverse impact on the Agreement. • General with definition of Brexit Given the uncertainties even a definition of Brexit is not too easy, but we have included one with an alternative generally worded Brexit clause. 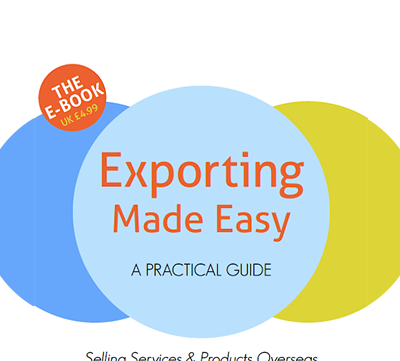 • Regulatory & Legal- If the rules governing your business activities or products diverge from those in the EU and this has a major impact on your business, you need to be able to deal with the consequences and we have three sample templates. In an extreme case this might mean trade has to stop altogether – e.g. a fish processor whose Spanish suppliers no longer have access to fish stocks in UK waters. • Restrictions on movement of people– if visa restrictions are imposed on travel between the UK and EU, could it affect technical support services and supply of labour to your business? There are three sample clauses. • Territory – if you have a contract that assumes you have free access throughout the EU and/or that the UK is part of the EU, will the contract still be effective after we leave? Many contracts have a clause defining the territory covered by the contract – e.g. 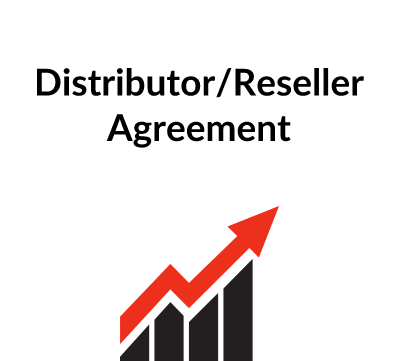 an agent or distributorship agreement. We have a couple of sample clauses to deal with this.